Ross delivers a Land Based Studies course in partnership with Norton Radstock College. The course is accredited by City and Guilds through the National Proficiency Tests Council. With over 20 years of experience working with teenagers with difficulties; he set up three alternative education centres in Belfast. 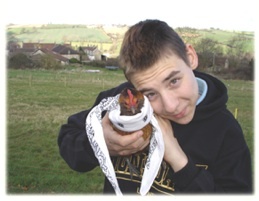 It was natural for Ross to want to offer Laurel Farm's facilities to local young people. He started working with young people at Laurel Farm in January 2007. 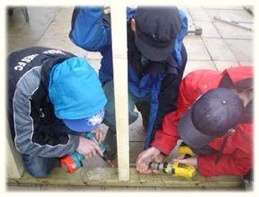 The young people enjoy the opportunity to be in the outdoors, play, construct shelters and care for small animals. 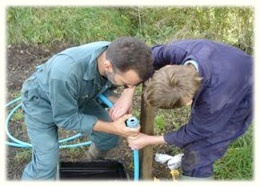 The young people reap huge benefits from free play, contact with small animals and learning construction skills. They play with water, light fires and have real contact with the natural environment. They can show love for small animals in a non-threatening way, something that can be difficult for adolescents. The greatest benefit in working with the animals comes from being able to express affection for them, something that adolescents often find difficult. 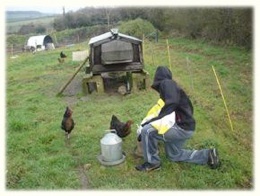 Working with sheep, pigs and poultry, they gain an understanding of where their food comes from. Finally, there is always a construction project on the go, building a tree house, shelter or small bothy. To see the young people at work and play, click here.